Drilling straight or perfectly perpendicular holes in wood is sometimes very important. Hand tools will only give close but not perfect results. A quick tip: Whenever drilling by hand, place a square or right angle on the surface as a visual guide. Over time this will help your eyes become a better judge of straight and perpendicular, although probably never perfect. 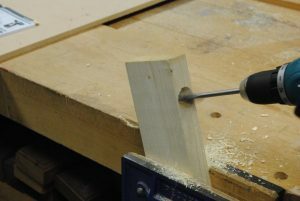 The easy answer when perfectly true and straight holes are needed is to use a drill press, which often means bringing the pieces to be drilled to the drill rather than the other way around. This is not always an option but there are drill-press-like attachments that can be used in conjunction with hand drills to guide them for a perfect result. Depending on the circumstances, these add-ons can be quite effective. 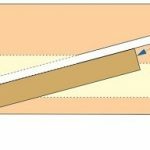 In situations where drilling a few straight or perpendicular holes is required, a drilling block can be used. Drilling blocks, which are essentially just a block of wood with a hole pre-drilled to the desired bore, are usually made of hardwood and made as needed for the job at hand. They should be at least as thick as the desired hole is deep. Usually they will be made by the woodworker on an as-needed basis. Most twist drills are designed to only cut at the nose, not at the sides, so in most cases when using a drill block, there will not be much wear on the sides of the hole in the block. However, to prolong the useful life of a drill block, it is recommended to lubricate the sides of the drill bit. In the old days, carpenters would often have a block of beeswax in their box for just such a case. Nowadays, you will be lucky if you can find beeswax at your local hardware shop. As a substitute, a block of hand soap can be used, although a lubricant soap will be less durable and will need to be reapplied more often. Simply rub the bar of soap down the side of the drill bit before use. Other factors to consider are the type of drill in use and the nature of the wood being drilled. Differences in the density of the grain in the wood will draw the drill slightly as the drill works its way into the material, if the grain is running in an opposing direction and the grain is heavy enough. The best solution is to choose your material carefully. Tight grain hardwoods will drill more evenly. Note: Hardwood is not always harder, the term in fact refers to the density or closeness of the grain and is officially determined by the type of leaves that the tree produces. As far as the drill bit is concerned, the cutting tip or nose will also make a difference. Brad point drill bits or W bits are designed to make the smoothest, cleanest holes in wood and are often described as “wood drills”, although there are many kinds of bits that can be used to drill wood. In this case, their use would be recommended.